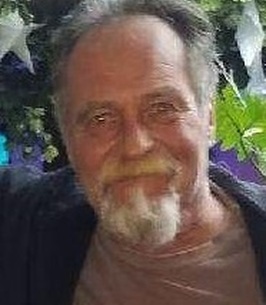 Gerald “Gerry” Behuniak, age 61 of Seymour, entered peaceful rest on Tuesday, October 23, 2018 in Griffin Hospital surrounded by his loved ones. Born in Derby on January 17, 1957, he was a son of the late Peter and Stella (Spak) Behuniak. Gerry was a retired office manager for Davis Oil. He loved the outdoors and could often be found gardening. A great story-teller, Gerry was known for his quick wit sense of humor. He will be remembered for his creativity and love for music, especially Steely Dan. Survivors include his beloved children, Stephan Behuniak and his fiancé Jennifer Saksa of Seymour, and Rheanna Behuniak of North Haven; brothers, Peter Behuniak and his wife Gail of Glastonbury, and Joseph Behuniak of Cheshire; sister, Christine Spak-Aldo and her husband Ronald of Woodbridge; and his longtime friend, Renee Kmetz of Beacon Falls. Prayer Services will be held on Sunday, October 28, 2018 at 5:00 p.m. in the Ralph E. Hull Funeral Home, 161 W. Church St., Seymour, CT 06483. Family and friends may call on Sunday in the funeral home from 2:00 p.m. until the time of service. Interment will be held at the convenience of the family. Memorial donations in Gerry’s name can be made to the Smilow Cancer Center Closer to Free Fund, P.O. Box 1849, New Haven, CT 06508 (www.givetoynhh.org/closertofree). To send flowers to the family of Gerald "Gerry" Behuniak, please visit our Heartfelt Sympathies Store. My condolences to the Behuniak family. Gerry was a friend and a great neighbor. The many times spent once again under the tree in the yard! Good laughs, great stories, especially the way out there stories! Taking turns listening to each other's music outside. He had a good taste for music and a kind heart. My prayers are with you all.